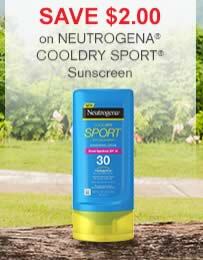 Save $2.00 on NEUTROGENA COOLDRY SPORT Sunscreen with this printable coupon from Healthy Essentials. On sale at Walmart for $8.97. You can either log in to your Healthy Essentials Account to print your coupon to earn points or you can use the standalone link below.